La Pau is a Barcelona metro station located in the neighbourhood of the same name, in the Sant Martí district. The station is located underground of carrer Guipúscoa and carrer Ca n'Oliva. It was opened in 1982, serving then as the terminus of L4, which had just been extended to La Pau from Selva de Mar. In 1997 it became the northern terminus of L2, which had formerly been in Sagrada Família. After several modifications on both lines, it has finally become the north-eastern terminus of L4, which is currently undergoing a substantial extension towards the future Sagrera railway station. 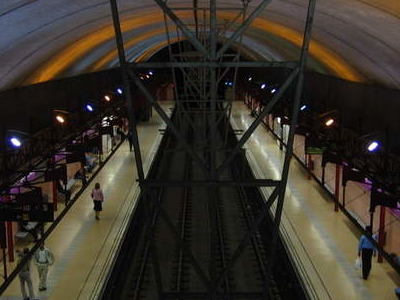 Here's the our members favorite photos of "Metro Stations near Sant Martí". Upload your photo of La Pau!